Rob Vivona of Amusements of America told Carnival Magazine that the show has purchased a new Wisdom Sizzler as well as a Falgas Far West Train. In winter quarters the show will refurbish their double decker dark ride manufactured by Barbison and build new bunkhouses. Both projects are planned for completion in time for spring. In March Amusements of America will add a Denny’s Electronics LED light package to their KMG Fireball. In addition to the new Chance Freestyle set for delivery to Ray Cammack Shows this spring, Chance Rides reports that contracts for a family coaster going to Wildlife World Zoo and Aquarium in Phoenix, AZ and a Revolution 20 going to Beech Bend Park in Bowling Green, KY were signed during the 2012 IAAPA Attractions Expo. The coaster is set for delivery in 2014 and Revolution 20 for this spring. According to the ride manufacturer, information about the new Freestyle was met with favorable reviews at the IAAPA Attractions Expo as well as at the IAFE Convention in Las Vegas, NV. The Royal American Shows are set to be featured on an upcoming episode of the History Channel’s American Pickers. Show hosts Mike and Frank visit with a past employee of the Royal during their journeys. 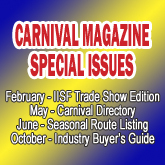 The show consulted Carnival Magazine for research during production of the episode which is to air soon. The Nebraska State Fair won a number of awards at November’s IAFE Convention and Trade Show including first place in the category of communications. The fair’s website (statefair.org), electronic newsletter, mobile app, and overall mobile campaign were all factors leading to the honor. The 2013 Nebraska State Fair will run from August 23 through September 2. Wade Shows will provide the midway. This marks the show’s first year as midway provider at the Nebraska State Fair. James Gang Amusements of Andalusia, Alabama has been awarded the contract for the 87th annual Putnam County Fair in Cookeville, Tennessee. According to the Herald Citizen newspaper, the show will provide about 30 rides along with 5 food concessions and around 20 games. Mega Midway Entertainment has provided the event’s midway for the past 10 years. Dates of the Putnam County Fair in 2013 are August 1 through 10. A new attendance record was set at the 94th Steele County Free Fair in Owatonna, MN, which ran from August 14 through 19, 2012. Along with the highest attendance ever at 321,396 guests, the fair also grossed its highest number at $1,082,236.00. Gold Star Amusements of Minneapolis, Minnesota provided the midway. It was the first year of a two year contract for Gold Star who provided about 40 rides. Carnival gross also set a record at $150,963.00, up 28% from 2011. Top rides were led by the Freak Out, Century Wheel, Alpine Bobs, Muzik Express, and Remix II. The 2013 Steele County Fair will run from August 13 through 18. The Ohio State Fair saw a profit for a fifth straight year in 2012. “We’re not in the business to make a lot of money, but it’s great when we do,” Fair Manager Virgil Strickler told the Columbus Dispatch. Attendance was slightly up in 2012 compared to the year before with 840,306 attendees—the second highest attended 12-day Ohio State Fair since 2004. Amusements of America provides the midway for the Ohio State Fair, which runs from July 24 through August 4 in 2013. The Volusia County Fair & Youth Show reports that attendance hit 185,500 at this year’s November 1 – 11 event. The figure marks the event’s second best attendance since opening in 1923. Deggeller Attractions is the midway provider for the Volusia County Fair. Along the midway gross was up by 6 percent compared to 2011 and was recorded as an all-time record at the event. Film star Jennifer Garner was spotted enjoying amusement rides with her two young daughters while filming a movie in New Orleans this holiday season. She was spotted along with her daughters at City Park’s Celebration in the Oaks riding a merry-go-round, amusement wheel, and bumper cars. The attractions are owned by the city park. Current Showman’s League of America President, Chris Atkins, reports that the annual SLA banquet and ball in Las Vegas was a huge success. “Sam Johnston surprised attendees with a huge movie star, literally,” he says in reference to a visit from Tai, the elephant star of the film, “Water for Elephants.” Tai was available for photos at the banquet. “The highlight of the evening was the ‘Let’s Dance’ competition, which raised money for the SLA, OABA, and IAFE,” says Chris. “The banquet was well attended and all had a great time.” See next month’s issue of Carnival Magazine for a complete article on the Showman’s League of America’s 100th year. Wayne "Jake" Inners of Majestic Midways has notified Carnival Magazine of a change in their corporate structure. Jake stated that more responsibility would be shifted from him to the staff as he is resigning as President but maintaining the position of CEO. Scott Inners, Jake's son, was appointed as President and COO. Keith Inners will remain Unit #1 Manager, Larry Johnson is Maintenance Supervisor, and Viva Inners remains Secretary/Treasurer. Despite the state of the economy, Majestic Midways is growing at a solid pace. The company saw a gross increase in the 2012 season. As of this date, a new Owens Dark Ride has been purchased and it will be exhibited in Gibtown. Also, they have recently purchased an additional bunkhouse from Lifetime Trailers. Happy birthday to Ron Burback! The owner of Funtastic Shows turned 80 this year and the occasion was marked by a dinner organized by his wife, Beverly. Among those wishing Ron a happy birthday in person were members of the Puyallup Fair who have worked with Ron for many years. Hurricane Sandy struck the East Coast of the U.S. on Monday, October 29. Along with a mass of personal and public damage caused by the storm a number of amusement parks suffered catastrophic consequences. In Seaside Heights, New Jersey the Star Jet Coaster jutted out of the Atlantic Ocean and many other pier attractions were gone completely. Other amusement parks to be hit by the storm to one degree or another include Coney Island in New York, Keansburg Park in New Jersey, and Atlantic City’s Steel Pier. In the case of Keansburg Park, one of the locations hit hardest by the storm, owners have already set a date for reopening—April 8, 2013. The Arkansas State Fair in Little Rock, AK saw an attendance increase of 28% in 2012 compared to last year. A total of 447,938 fairgoers attended this year’s event. The single-day attendance record was hit three separate times this year, including on Saturday, October 6 when 88,210 guests attended the fair. The Arkansas State Fair ran from October 12 through 21. Deggeller Attractions provides the midway. Paid gate totals increased on key days at the Tulsa State Fair in Tulsa, Oklahoma this year. A new record for paid gate revenue was set on Sunday, October 7. Overall attendance was down slightly compared to last year due to weather. The event ran from September 27 through October 7. Murphy Brothers Expositions provides the midway. California State Fair & Expo General Manager Norb Bartosik retires this year from his position. Norb has spent the last twenty years involved with Cal Expo and is spending his final months in the General Manager position to rally support for a revamping of the event. He states that the grounds need a major overhaul to match the growth in attendance that the fair has seen in recent years. Attendance at Cal Expo has increased for the last three years. Butler Amusements is the midway provider at the California State Fair. The North Carolina State Fair in Raleigh saw its third highest attended edition this year. A total of 965,297 fairgoers visited the October 11 through 21 event. Powers Great American Midways is the midway provider. See next month’s issue for a complete article on the Powers Great American Midways season. 153rd Mississippi State Fair will likely break attendance records once the numbers are confirmed. The event ran from October 3 through 14 and was on track to host more than last year’s record-breaking 694,000 fairgoers. North American Midway Entertainment provides the midway at the Mississippi State Fair. The New Mexico State Fair greeted 407, 265 visitors at its 2012 event, which ran from September 12 through 23. A single-day attendance record of 67030 was noted on September 19 when admission to the fair was free. The event ran for 12 consecutive days this year as opposed to past years when they closed on Mondays and Tuesdays. Murphy Brothers Expositions provided the midway. Show owner Jimmy Drew reported to Carnival Magazine that Drew Expositions has acquired the classic Velare Brothers (Curtis and Elmer) piece, the Space Wheels. This one-of-a-kind piece was owned by Royal American Shows for many years before Cumberland Valley Shows purchased it. It was last owned by Pat Guthrie’s Gold Medal Shows. Drew Expositions has experience with similar major restoration projects such as their work on the Seattle Wheel. “We just took this ride into possession on Wednesday, October 24,” says Jimmy Drew. “It is going to be a showpiece,” he says of the 1958 ride. Jimmy expects that it will take the show two to three years to restore it. “We’re not in a hurry and we don’t want to cut corners.” The show will first steady the trailers and load, next get it loaded in the sequence that they want it, and then begin on the restoring of the trailers. Once that is complete they will take the ride piece by piece from rim rails to spokes and modernize it with top-quality materials. Among the work that Jimmy already knows they will do is the replacement of old tires with new, tubeless ones; replacing the axle with a new suspension system; stainless steel boxes and fencing; and replacing the dolly system. They will also modify the drive system, slowing the machine down during operation and thus making it more of a family ride than in its past life. “The Velare Brothers were artists in their own right and we do not want to see this magnificent and elegant work of art confined to the trash bin of history,” states Jimmy Drew who is excited to restore this piece for the show as well as for the benefit of the industry-at-large. The State Fair of Texas concluded this past Sunday, October 21 with early predictions inidcating positive, and possibly record-breaking gross, for the ride gross and food concessions. Sadly, the event's beloved statue and mascott, Big Tex, was destroyed by fire on Friday, August 19. The 52-foot cowboy statue sttod tall for 60 years at the State Fair of Texas. The cause of the fire is yet unknown. Fair organziers have already stated that they intend to rebuild Big Tex before next year's fair. Also making news on closing Friday of the State Fair of Texas was the malfunction of the Stratosphere owned by Sky Attractions. The piece stranded 24 riders in the air for two and a half hours. There were no injuries as a result of the incident.